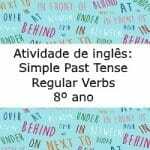 Atividade de inglês, direcionada aos alunos do terceiro ano do ensino médio, com questões elaboradas sobre gramática na língua inglesa. Você pode baixar esta atividade de inglês em modelo editável do Word, pronta para impressão em PDF e também a atividade respondida. Choose the verbs form that Best completes each setence. 1) They could not hear the Bell because they ______ to the radio. 2) When she entered the house, she ____ the phone ringing. 3) Three weeks ago he _____ the house that he _____ before. 4) They ______ long distances when they were younger. 5) When her father ____ home yesterday, she ____ him the truth.